Check in time: 3:00 pm – 8:00 pm. If you expect to arrive after 8:00pm, please call to make arrangements. Check-out time: 11:00 am. Late check out up to 2 hours can be requested upon availability at extra 25% of daily rate. Our rates are for single or double occupancy only, and do not include tax. The maximum number of persons per room is two except for the whole house rentals. We accept Visa, MasterCard, and cash. Room rates posted are subject to availability and can change without prior notice. Full payment is required to confirm your reservation at our Hermann Missouri Wine Country Lodging. Cancellations made at least 30 days prior to your arrival date, full amount less a $75 cancellation fee will be refunded, cancellations made within 14 to 30 days prior to your arrival date, a gift certificate will be issued for full amount less a $75 handling fee, the gift certificate is valid for one year from the date of your cancellation. For cancellations made 14 days prior to your arrival date, no refund will be provided. Changes of reservation date or early departure are treated as cancellations and will carry the same policy stated above. You are, however, always welcome to send friends or family members in your place with notification in advance. Group or individuals whose reservation consisting of two (2) or more rooms for any given date, the policy above extends the cancellation notification period from 30 days to 60 days for full refund. Gift certificate will be issued for Cancellations made between 30 to 60 days, cancellations within 30 days, payments are non-refundable. We have one guest room that can accommodate one couple with children at our Hermann Lodging. Rates are based on two-person occupancy, additional $50/person nightly charge will be applied to the room. 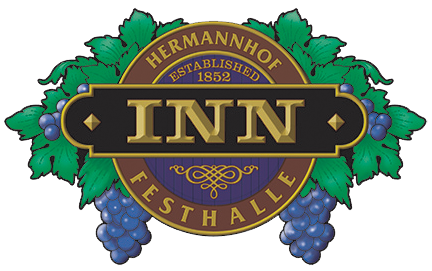 Our Hermann MO Accommodations are not designed with small children in mind, so children 12 years old and above are welcome in the company of primary guests to be 18 years or older. Our whole house rentals will accommodate families with children and makes a nice choice for a family getaway. We promote a smoke free environment inside of our premises. Guests are welcome to smoke in our garden or outside of the Inn and Cottages. Teresa’s Garden is the only pet friendly guest room, please call the Inn directly to reserve. Only one pet is allowed and must weigh less than 50 lbs. A $75 pet fee per day will apply. Rooms with a pet may not be booked without specific pet reservations and may not be booked online. Pets are not allowed to be left in the room unattended. If any damage is done to the room by your pet, all damage cost will be charged to you. We would love to hear from you, please call us (573-486-5199) with any questions or email us at info@innathermannhof.com.